Native Americans endure a legacy of healthcare disparities, leading to disproportionate disease rates. 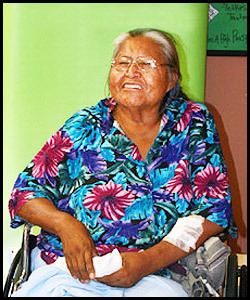 People living on the remote reservations we serve rely on Indian Health Service (IHS) clinics for medical care. Severely underfunded and understaffed for the size and location of the populations it serves, IHS focuses on healthcare crises rather than preventive care. Transportation too is an impediment to healthcare because of the long distances to clinics and the lack of transportation. SWRA’s Health service supports Program Partners who promote a healthy lifestyle by educating Native Americans about the importance of good nutrition and exercise. Our partners also encourage healthy habits by distributing SWRA-provided incentives items such as first aid kits, bandages, non-prescription medications, lotions, toothpaste, shampoo and other personal care items that are not widely available on reservations and are typically too expensive for impoverished budgets. More Native Americans participate in health education classes and programs and learn about the importance of good nutrition, and exercise, to prevent health problems, and how to deal with diseases if they have already occurred. More community members attend health fairs and learn about health resources in their communities, participate in health screenings, and get referrals to the appropriate resources if they need further medical attention. SWRA hopes that these health screenings will help to catch diseases early so that patients can seek the medical treatment they need. Exercise classes and walking clubs. Residents learn how to exercise and participate in exercise classes and clubs. . Monitoring blood pressure, blood sugar, weight, and cholesterol. Increased numbers of patients who participate in health screenings such as blood pressure, blood sugar, cholesterol, weights, etc. can monitor potential health issues. Many of our Program Partners use our incentive products to keep diabetes patients healthy and active. Patients make the extra effort required to find transportation, wait hours and hours to see a doctor, and to comply with difficult regimes (such as for diabetics) and restrictions (such as reduced fluid intake), when they know they can receive these needed products.. The healthy lifestyle services offered by our reservation partners and supported by SWRA serve thousands of Native Americans each year.